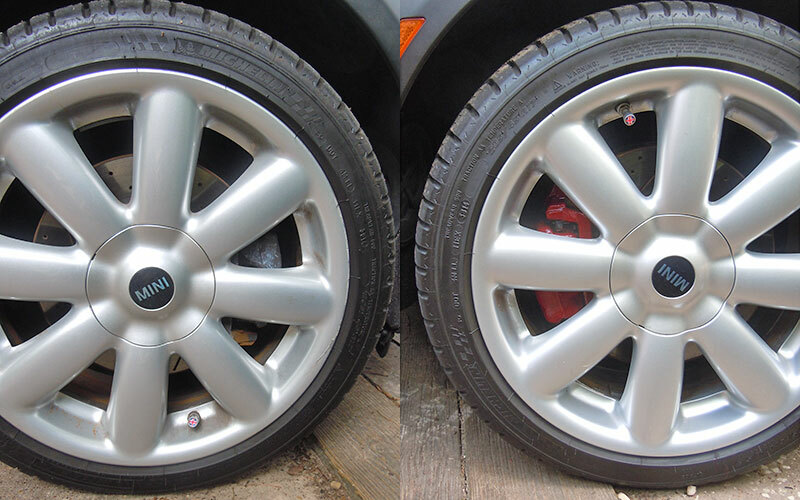 I painted the calipers on my 2015 MINI Cooper S Countryman right after I got it. In fact, the brake calipers were so clean I just wiped them off and started painting. This year (2016) my wife bought a 2009 MINI Cooper S convertible and wanted her calipers painted too. 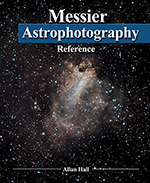 This time I decided to put up a little walk through to show people just how easy it is. If you have ever thought about doing this, there is absolutely no reason you can’t, it takes about an hour. Wear eye protection! 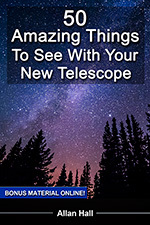 You will be working with chemicals that could spray off and get into your eye causing pain and potentially permanent blindness. Don’t take a chance, go buy you a $10 pair of safety glasses from Wal-Mart or Home Depot. Never rely solely on a jack for support of a vehicle, use jack stands. Jack stands are made for this use. 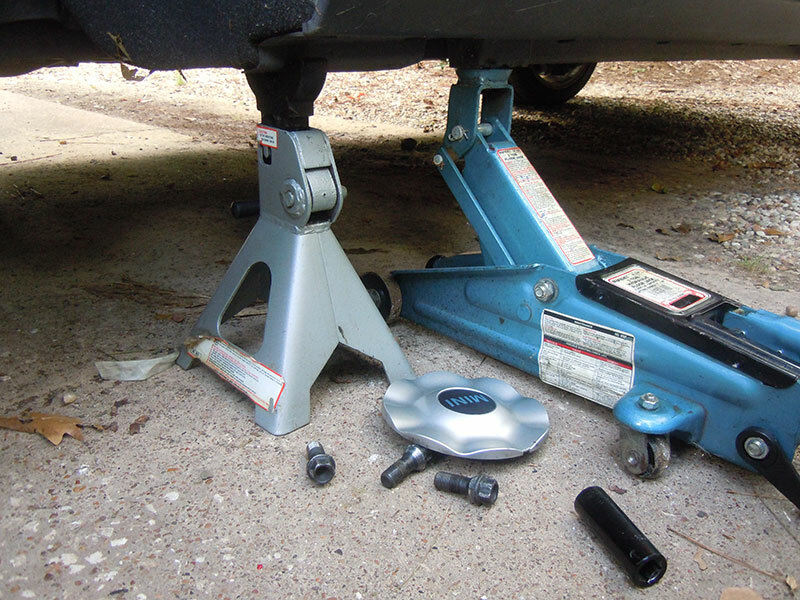 Make sure the jack and any jack stands are on clean, flat and level surfaces such as concrete. Never rely solely on the internet or anyone on the internet for your safety. If you do not know what you are doing, ask a professional for help or advice. If you choose to proceed with this I assume no responsibility at all, do this at your own risk. The first thing to do is find the jack points on your car. These are the places where you are supposed to use a jack to lift the car off the ground. Most of the time you can find this information in your car’s owner’s manual. You have read that, right? Next use a lug wrench, impact wrench or other means to just slightly loosen the lug nuts on the wheel you will be working on. 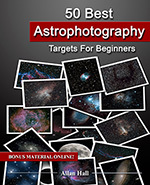 You are just trying to get them started, do NOT loosen them much or remove them. All you want is for them to be easy to get loose with the wheel off the ground so a good half turn is usually fine. Once the tire is off the ground at least a couple of inches use a jack stand to secure it. I suggest you lower the jack a little transferring a little of the weight to the jack stand making sure everything is stable. Check the tire again to make sure it is still completely off the ground. Now loosen the lug nuts and remove them. Remove the wheel and lay it on the ground a couple of feet away to use it as a seat while you work on the calipers. 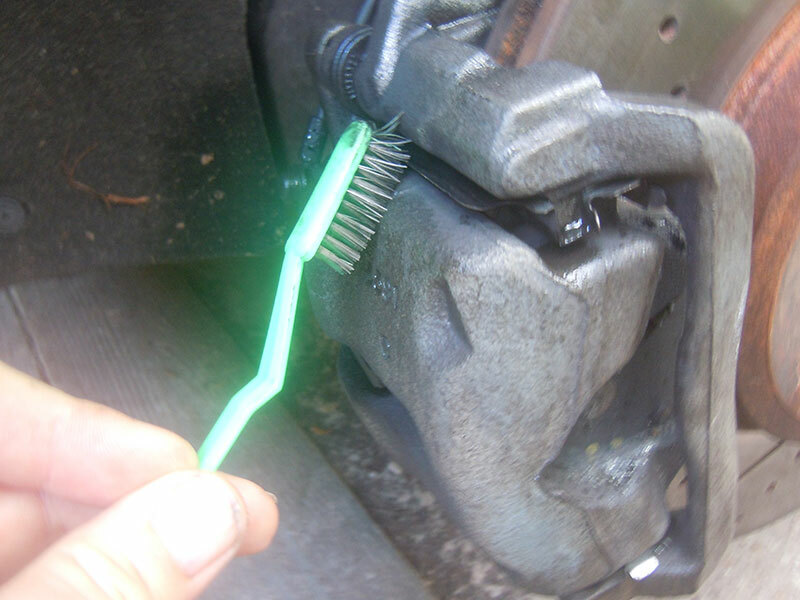 Now you want to use some form of stiff brush to brush away as much dust and dirt off the calipers as possible. The more you get off here, the better and easier it will go. 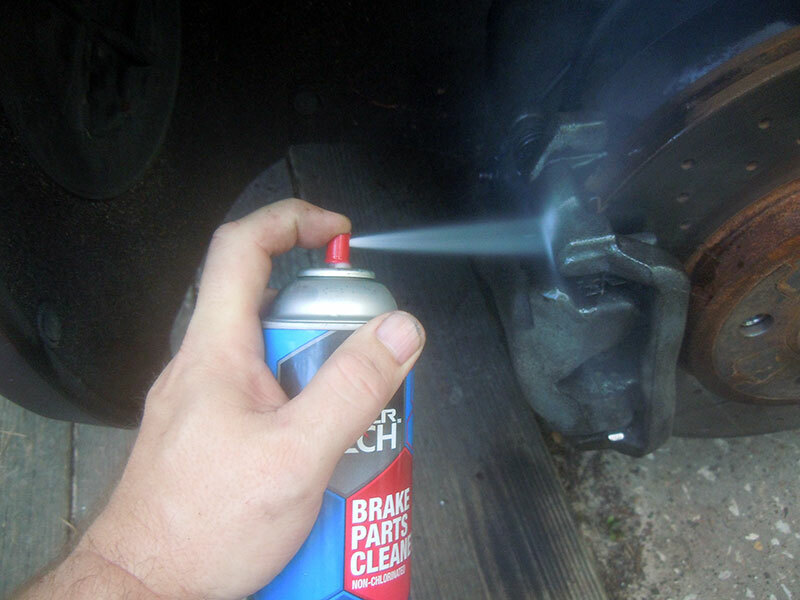 Next, use the brake cleaner to clean off as much as you can. Be careful with the brake cleaner, it can really irritate your skin and whatever you do keep it away from your face. Use the toothbrush to scrub hard to clean areas that may have built up gunk on it. 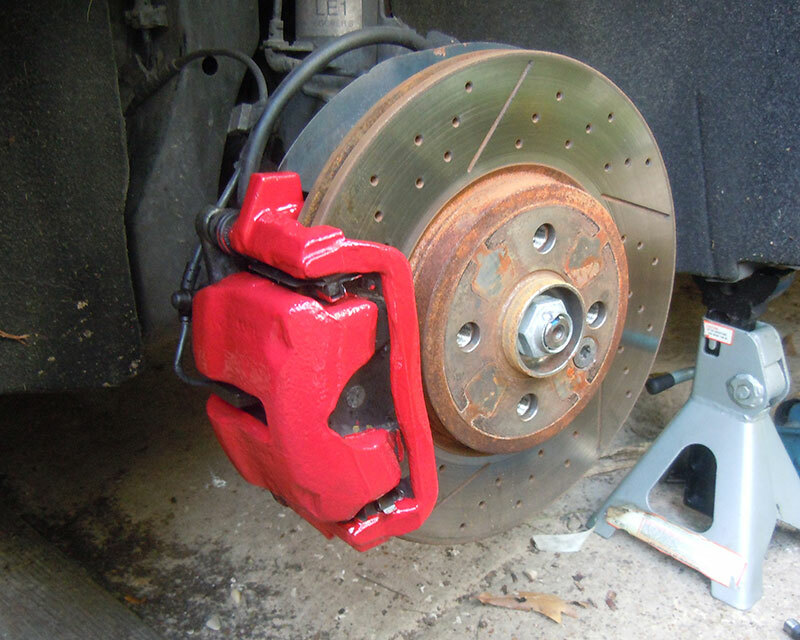 The cleaner the caliper, the better the paint will stick. Use another rag to wipe the caliper dry of any brake cleaner that did not evaporate and give it a few minutes to make sure it is really dry. Shake the can of paint well to make sure it is mixed up and then use a flat head screwdriver to open the top. 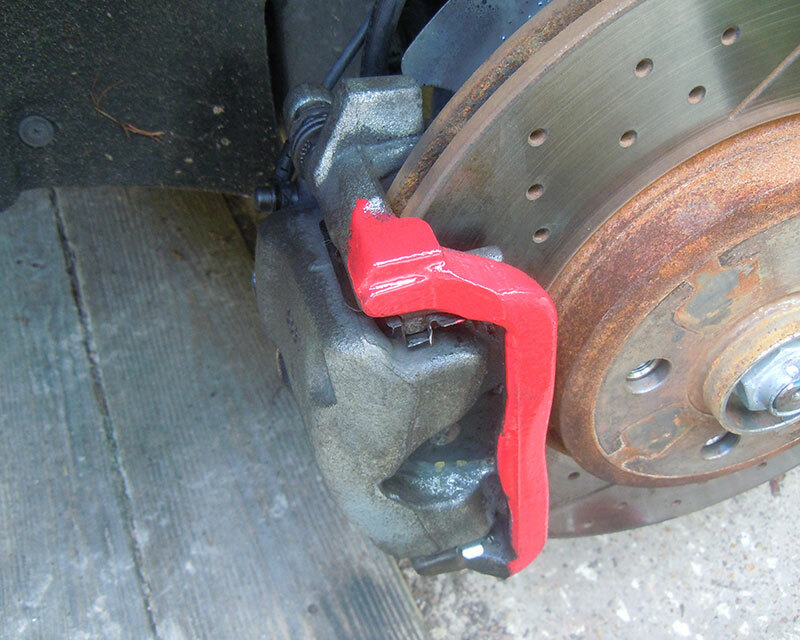 Dip the brush in and start painting the caliper. You should apply fairly thin coats. Do not worry about the metal showing through, this is normal. You should put on a light coat, wait a while, then put on a second coat. Repeat this until you have a nice solid coating. Once you are done, allow the paint to dry until it is dry to the touch. You can put the wheel back on before this but you run the risk of getting paint on the inside of your rims. Once done, put the wheel back on, install the lug nuts, tighten the lug nuts as tight as you can get them with your fingers but DO NOT USE TOOLS. Jack the jack up to clear the jack stand and remove the jack stand. Now lower the car back onto the ground and remove the jack. Finally, tighten the lug nuts. If you are unsure how tight to tighten your lug nuts get them reasonably tight and take your car to a tire dealer and have them check. Car manufacturer’s give a torque specification for how tight the lug nuts should be. Most mechanics can get pretty close by feel. The correct way is to use a torque wrench which is available from most auto parts stores, larger hardware stores and any Sears with a tool department. The torque specifications are listed in your owner’s manual. Before on the left, after on the right. Subtle but nice.